Agility is defined by the speed with which physical or mental abilities are related, that is, the speed with which one is able to execute a movement. It is not an inherent trait in the human being and can be improved by training. Improving balance is one of the ways you can increase your agility. Movement of rotation with, for example, medicine ball, make lateral jumps and squats with one leg allow the development of the center of gravity of the body. Another practical advice that allows the improvement of agility is weight training, which helps keep the muscles toned and conditioned. Rapid pushups and aerobic exercises are good examples. Running is always an activity that helps keep your body in good condition. For the course to have positive effects on the agility of each one, changes in pace and direction must be included, trying to make the complexity more and more frequent. Rapid movement exercises such as jumping rope, mirror and ladder adapt your body to quick physical and mental reactions. Without major complication, designing a circuit with obstacles facilitates the training of agility. Over time, it is advisable to reduce the execution time of the circuit or increase the number of obstacles. Practicing any sport and avoiding a sedentary lifestyle is already a first step that takes our body away from the loss of agility, although pelota and handball are mainly activities that improve the coordination of the human body. Training agility with Mass Suit is not an exclusive recommendation for professional athletes or for people with a sedentary lifestyle. It is for everyone including students. Power is defined as the maximum resistance a muscle or muscle group can develop at a specific speed over a set time and distance. If the athlete is in contact with another athlete, then resistance arises. Here scientific research has shown that there is a clear connection between the agility of the athlete and his power. The more important strength and speed in a sport, the more important is the strength training. Speed ​​is defined as the speed with which a particular task is completed – force multiplied by speed: the faster an athlete gets from A to B, the more speed he has. Acceleration is the rate at which an athlete can increase his current speed. It defines the ability of the athlete to increase the movement speed from his starting position. Braking is defined as the ability to slow down or come to a complete standstill. The task is to reduce the speed as fast as possible with various techniques such as sliding steps, sideways steps, crossovers, triple steps etc. Coordination is defined as the ability to perform or control muscle movements to master athletic challenges. Dynamic balance is the ability to control the body as it moves. A body in motion receives a variety of feedback from the nervous system, causing it to adjust the body’s center of gravity. These include, for example, information about the nature of the soil and its interference. Agility is clearBalance: A well-coordinated athlete has the ability to balance in order to always adopt the position of his body to the external environment. Flexibility is defined as the range of motion of a joint in motion. There are a variety of suitable forms of exercise that can be integrated with the warm-up program and which improve the dynamic flexibility, coordination, speed, and balance of the joints. 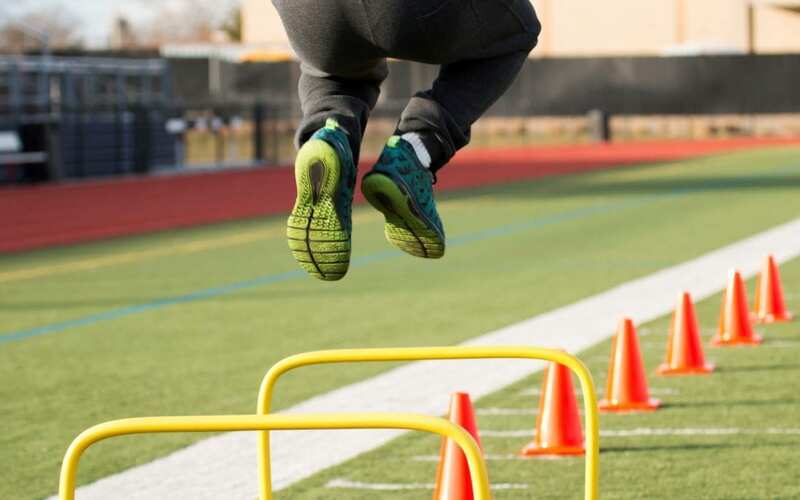 Technique: When trainers try to introduce athletes to the forms of agility training, technology is a particularly important aspect. Glancing, arm movement, deceleration, regeneration and biomechanics are key to the proper execution of these exercises. Gaze guidance: Regardless of which direction the movement leads, the gaze must always be directed towards the game device, the action location or the opponent. The athlete should keep his head and neck in a neutral position and keep his eyes straight ahead. The only exception is the situation when an athlete should keep an eye on another athlete or a certain object. He should initiate all direction changes from the head. That is, every change of direction begins with a head movement in the desired direction. Arm movement: To change the direction efficiently and quickly, an active arm movement is necessary. This supports the athlete to record speed as fast as possible. Lack of or ineffective arm movement leads to a loss of speed and efficiency. Deceleration: Safe and efficient deceleration from high speed is required to change direction without unnecessary loss of speed. Regeneration: One must be careful to adjust the recovery time in a form of exercise always the pause length in the real game situation. Equal partners should work together. One should simulate competition situations. At the same time, a clean technology must always be in the foreground. A. Body Orientation: In particular, if an athlete wants to overcome an opponent’s resistance, he must maintain a low center of gravity. Only then can he be able to move fast, agile and efficiently, accelerate, decelerate, accelerate again and change his direction without losing his speed. To develop maximum power, the athlete must have a strong trunk. He must be able to maintain a neutral spine position by activating the spinal stabilizing muscles. And he must take an athletic attitude: shoulders deep and withdrawn, knees slightly bent, the deep abdominal muscles activated, the hips deep and pushed back, the body weight weighs evenly on the forefoot. B. Economics of Movement: Athletes need to know and master the most efficient movements of their sport if they want to exhaust their athletic performance. The central movement sequences include Sliding steps, sideways steps, cross-stepping, triple steps, twists combined with footsteps and combinations of these running techniques. C. Acceleration and deceleration: In most sports, acceleration and deceleration movements occur. The more efficiently an athlete can perform such movements, the faster he can bring space between himself and his opponent, and the faster he can move toward his goal. Apart from practicing sports-specific skills, agility training is a key component of a training performance. In sports, not only is the bike running at a constant speed, it is accelerated, decelerated and accelerated again. Therefore, the individual must exercise sideways movements that occur simultaneously in different directions of movement. Movements are initiated from different body positions. Therefore, anyone involved must be able to act with power and explosiveness from all possible body positions.